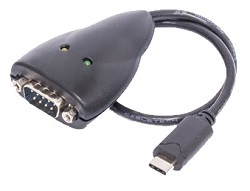 Quality USB TYPE C to RS232 serial adapter with the FTDI chipset for best compatibility. Virtual COM port drivers provided for Windows 10, 8, 7, Vista, XP, ME, 98, Server 2012, Server 2008, Server 2003, CE.NET (version 4.2 and greater), or RT in 32-bit or 64-bit installations. Also supports Linux Kernel 2.4 and above, MAC OS X 10.9 and above.